Now that it's cool to care about the Boston Marathon again, Fittish would like to familiarize you with the runners at the front of the pack. This morning's elite: Lelisa Desisa. C'mon, You Can Come Up With Something: Leezus; Deezus. That Looks Like A Pretty Good Year: Think of it this way: in a seven-month stretch, he earned as many medals and major wins as the United States has in the last twenty years. Likelihood of Victory: Very High. 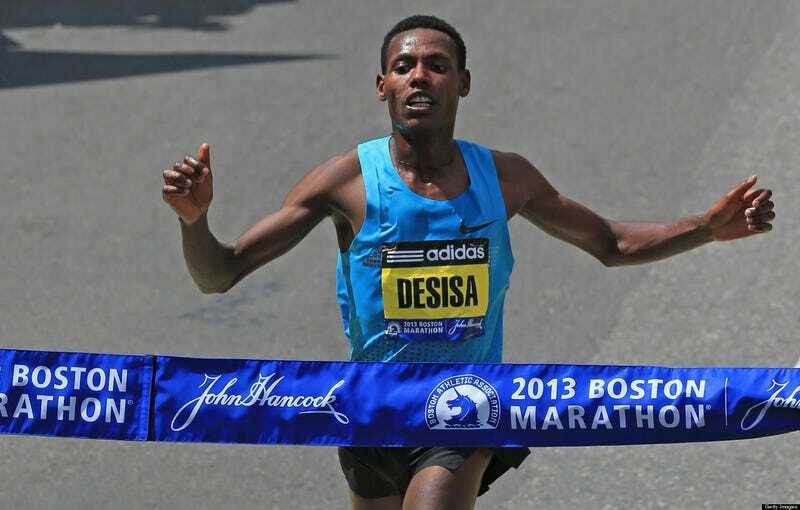 There aren't many guys who can run in fast conditions (Dubai), hilly conditions (Boston), and warm conditions (World Champs), but Desisa is one of them. Throw in the fact that he's the 24-year old defending champion, and you would think he's a near-lock to win. Well, two: the marathon is a highly unpredictable race that can reduce even the best athletes on the planet to a quivering shell of their former selves. But there's post-race beer and a DJ! Predicted Finish: First or Second. Fun Fact: Was named by Jar Jar Binks.